Milo R25, or just Milo to the people closest to him, stands at about two feet tall and teaches children with Autism. 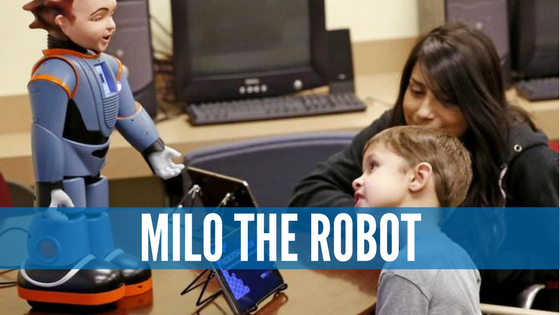 Thanks to the generosity of RoboKind, Milo’s creator, and donors like you, Milo now lives full-time at Achievement Center of Texas. Milo has been a member of our family since 2014. Patience is Milo’s best characteristic. No matter how many times he has to repeat himself, his tone of voice stays even. He accepts his students without judging them. He’s the perfect teacher for children with Autism. Milo does not teach the ABCs or math or barnyard animal names. Instead, he teaches the art of social interaction. Milo displays scenarios across the screen on his chest and asks his students “yes” or “no” questions about them. This robot for Autism prompts students verbally, but our students at Achievement Center of Texas use a tablet to answer his questions. Lessons can last between 30 minutes to an hour. RoboKind designed them to be short to better hold the attention of children with Autism. Milo’s main objective is teaching his students how to interact more successfully with their peers and their mentors. Communication is the cornerstone of feeling understood. When a student can effectively communicate with others, it reduces their frustration levels and deters aggressive behaviors. If your child or ward has Autism, he or she would have access to Milo as a student at Achievement Center of Texas. Click the button below to be redirected to our Enrollment page. Fill out the application to be considered for enrollment at Achievement Center of Texas. We wouldn’t be able to help our students with Autism with this amazing achievement in technology without donations from people like you. To help us help children with Autism, please donate today.